We've seen frost flowers, which I do want to try to make in my freezer (since I live in a place far too warm and dry to ever get frost flowers naturally). But I'm afraid that ice feathers, or rime ice, are not as easily doable. You can see them building up on the side of water, rocks, or branches, or you can see them in this post. These feathers are made by a combination of water and wind, which builds up ice on the sides of structures (almost always builds up on the wind-facing side). Although it looks, often, like frozen cartoon speed-blur lines, it's usually the result of a relatively gentle process. Low-hanging clouds and fog, in warm weather, make things drip. Water condenses on cold objects, and slides down to drip from them. When the object is too cold, the water doesn't condense to liquid, it freezes into ice. The ice stays on the building, and as more and more water is in contact with it, it builds up. Sometimes rime ice looks like wedding cake frosting, or cotton wool, applied all down one side of an object, or a landscape. If the wind is a little more intense, blowing the water away before it can freeze in some places while letting it build in others, things can get more complicated. As one bit of ice sticks out, often sheltering the patch of the object behind it, it gets more and more water dumped on it. Some kinds of rime ice look like hard spikes. Some look like razor blades, or smooth fins. 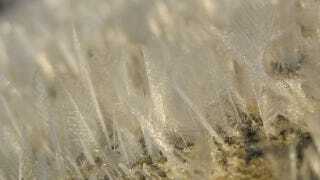 Some, with just the right application of floating water and wind, build up into amazing feather-like structures. These ice feathers can be seen, mostly, clustering around high branches, but they can also build up on flat surfaces like water, or on rocks near water. Often, items near water are a good bet, since some of that water will either evaporate or sublimate and let some very cold water float around in the air. Via NOAA and Wilson College.